Once you've created SyncGene account, it is very easy to share a calendar. 1. 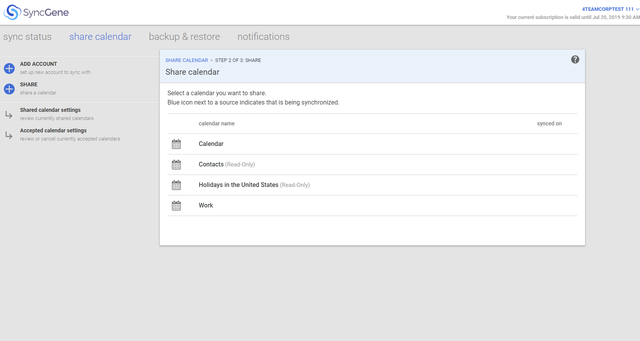 Go to “share calendar” -> “Share” (to share a calendar you need to add at least one account). 2. Add a Google account and/or the app account you want to share from. Alternatively, select an already added account you want to share a calendar from. 3. 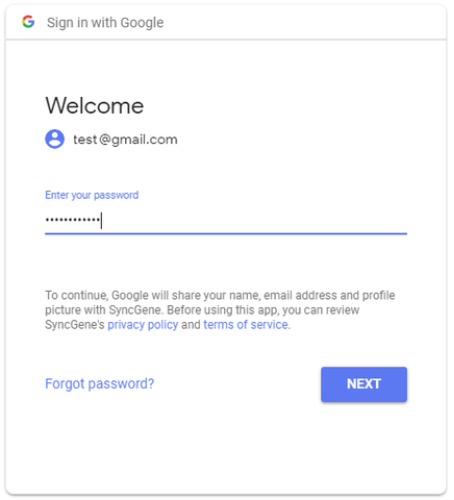 Enter credentials (login information) for an account. 4. Choose a calendar you want to share. 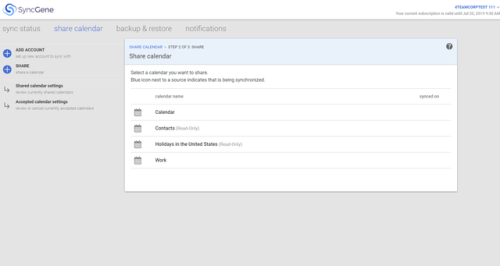 Enter e-mail addresses of people you want to share the calendar with, select sharing permissions. You can set different sharing privileges for every person separately. Once you have made a list of people you want to share the calendar with press “Share”. They will receive an e-mail with your invitation. Please note – if recipients did not receive a sharing invitation, make sure that they check spam folders. Alternatively, create a shareable link and send it to others using any method you want – messaging app, sms or send it via e-mail. Please note that shareable link gives “View only” rights to your Calendar. If you want to give Edit rights to other users, you need to invite them using emails.